A representative of the merchant consortium, Arkford of Selanthia, grew curious of the plot of land known as Coraesine Field. It had been four long years since diplomats gathered, and the disasters that followed. He decided it was time to return to the field, and see what had become of it. Last he knew, the gnomes caused an explosion and destroyed much of the spire during their visit in 5109. Arkford packed his things and began his journey toward the Elven Nations, to the area near Ta'Illistim known as Coraesine Field. Upon arrival, he found the field in turmoil. The various buildings were laid to waste, with foliage reclaiming most of the unattended land. Rubble and debris littered the pathways, and the oculus was stripped of any coraesine. Surrounding the former festivities lay a vast open field that remained uncultivated. Arkford noticed an oddity beyond the field. A bog oak forest that was not logged in any of the happenings of 5109. But the forest was mammoth in size, much larger than anything that could have began growing only four years ago. He explored the vast forest, but the foliage that claimed the land as home made the trails hard to follow. It seemed like the forest was even larger from the time he entered it until he exited it. How could this be? How could a forest grow that much in such a small amount of time? Arkford spent days wandering through the forest's depths, each time he entered, it seemed to be different. Will-o'-wisps fluttered through out the area, like colorful motes. Small hillsides interrupted the greenery, bringing with them narrow brooks and streams. Arkford eventually found a massive sprawling oak tree, and while observing this old guardian of the forest, he saw a beautiful creature off in the distance; a dryad. But she never stayed for long. Even when Arkford would wait for her, her presence was there for a fleeting moment. Was she the cause of the forest? But it didn't stop Arkford from planning a festival. Over the next several days, he began cleaning up the pathways, and tearing down the former remains of pavilions and tents, or well, he did the best he could. He gained the help of local farmers to help clear out debris and rubble, some of them helping with the field and attempting to cut down the overgrowth emerging from the forest. Arkford began inviting merchants from across the land, in hopes they could represent the dream that once was the Coraesine Field. To rebuild, to rejoice, and to celebrate the rebirth of spring. Familiar faces began arriving, setting up their various wagons and tents, with plenty of wares to offer. Many merchants bringing with them their best wares, and greatest services yet. They decided to invite adventurers to the festivities, but the attendance needed to be limited. Arkford began sending out special invitations, as well as fliers for the "Return to Coraesine Field." During their delivery, however, bandits ransacked the couriers, and the envelopes were scattered across Elanthia. Hopefully adventurers like you can recover some of these special invitations! 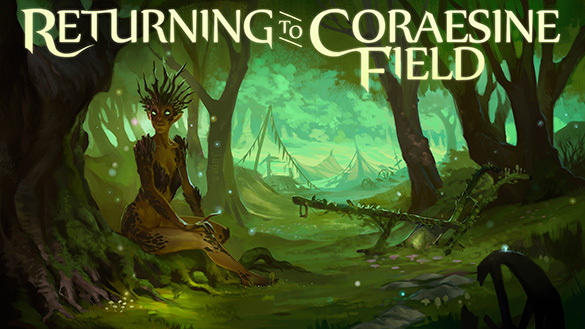 A mysterious forest surrounds Coraesine Field. No records indicate that it existed 4 years ago. One of the denizens of the forest, a dryad, has been seen asking for help. She wishes the forest to grow. Will you answer her call? Some say other forces are at play, that could cause a blight! Explore the forest and discover its secrets! During your adventures, you may come across a sealed parchment envelope within a treasure chest. These envelopes may contain vouchers for special services or discounted pricing for MAJOR services at the festival. You could even be lucky enough to find a free ticket to the event itself! For the most part though, they will be fliers advertising Returning to Coraesine Field. Merchants from across Elanthia have come to celebrate the rebirth of Coraesine Field. And with their arrival, they will be offering many great services, items, and shops! During the course of the week, many (fluff) scripts will be added and unlocked! Should you not be able to claim a MAJOR service, the consolation prize is a fully unlocked ClimateWear garment from a stock list of descriptions. We will make every effort during the weekend to make sure MAJOR services are released. Each month, after the initial run, we will be offering a lite festival experience. This will include the grounds, the shopping, and the quest. There will be absolutely no merchant activity during this portion of the event. Vouchers for special services can be redeemed (discounts for MAJOR services will be irrelevant) at this portion of the event.